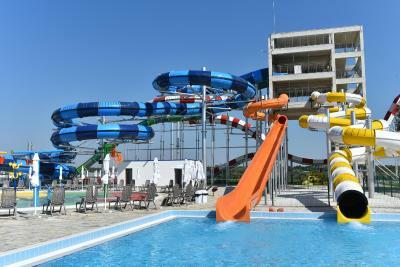 Lock in a great price for Topola Skies Resort - Aquapark & All Inclusive – rated 8.1 by recent guests! The swimming pools are great, especially for kids. 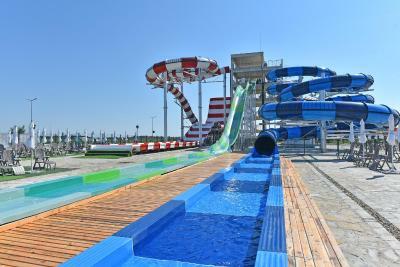 The Action Park and the Aqua Park are great facilities. The staff was very responsive to all our requests. Good location. Beach close and nice. Lot of space. 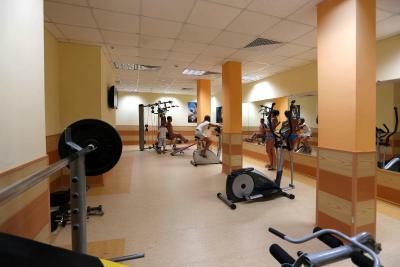 Facilities with options and equipments. Nice pools. I used to come with pleasure here to enjoy all the facilities. RO: Resortul arat foarte bine, cu piscinele si zonele amenajate in jurul lor. Poti face multe activitati. Aproape toata lumea vorbeste engleza. Camere spatioase cu A/C, balcon, uscator haine, feon... Locatia foarte potrivita familiilor cu copii. EN: The place looks really good, nice double pool, nice view from the end-less pool. 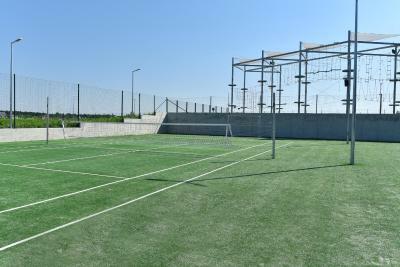 There are many activity spots (football, volleyball fields). Almost all the staff speaks or understands English. 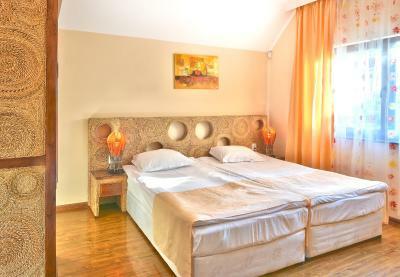 Mostly spacious rooms (one bedroom suites) with AC and balcony, hair dryer, clothes dryer, etc. It’s all focused around families with children, all the pools have areas for children, there is a child care-like service and playground. There are evening activities for children as well (disco, clowns). Mostly nothing. 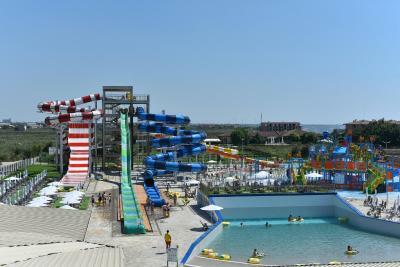 Aqua park was nice despite cold water. The food was very good and very clean and the restaurant! We had all that we want in one place! The Kibella beach is very close and very beautifull! The staff was great! 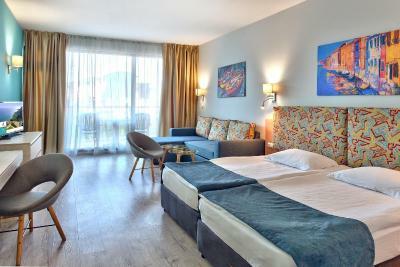 Great facilities in the resort: 3 big pools in 3 different areas, so it doesn't get very crowded, great water park included in the price with easy access, hiking area for kids & adults, transfer to the sea by minibus. 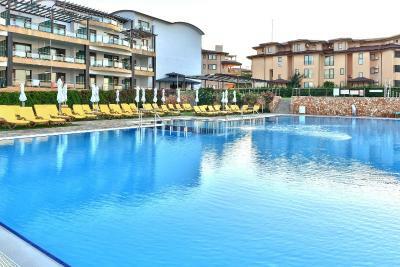 Topola Skies Resort - Aquapark & All Inclusive This rating is a reflection of how the property compares to the industry standard when it comes to price, facilities and services available. It's based on a self-evaluation by the property. Use this rating to help choose your stay! 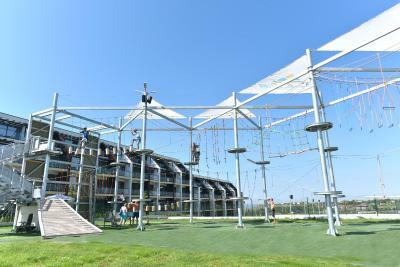 Beautifully located at the Northern Black Sea coast between Kavarna and Balchik, Topola Skies Resort - Aquapark & All Inclusive is an ecological holiday complex on the plateau of Topola Village. A free shuttle bus is running several times per day to the nearest beach. A supermarket is available on site. 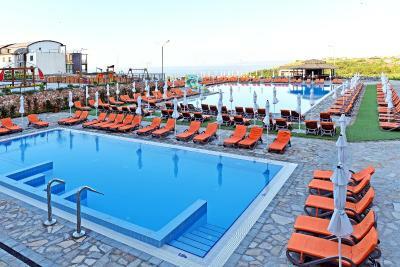 Boasting magnificent views over the sea and over Thracian Cliffs, which is the biggest golf course in the region, designed by Gary Player, Topola Skies Resort - Aquapark & All Inclusive is a perfect holiday destination not only for golf enthusiasts. 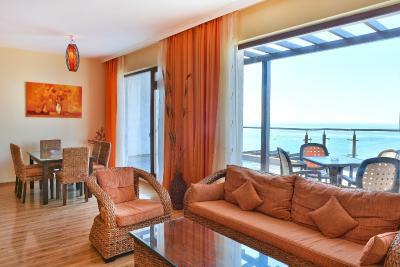 The property offers luxurious apartments located in 4 buildings. 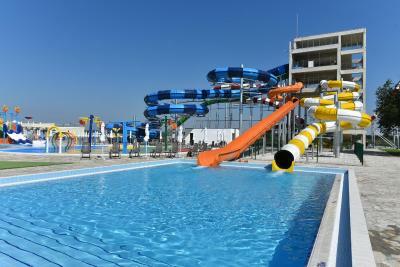 There is also a 2-level infinity swimming pool, children's pool and playground with a water slide and a water bar. All pools are heated, and there is a large spa area offering balneotherapy and various wellness treatments. The All-Inclusive rates consist of a breakfast buffet, a lunch buffet, a dinner buffet, hot and cold drinks including wine and beer, as well as an afternoon snack plus coffee at the lobby bar and at the pool bar. 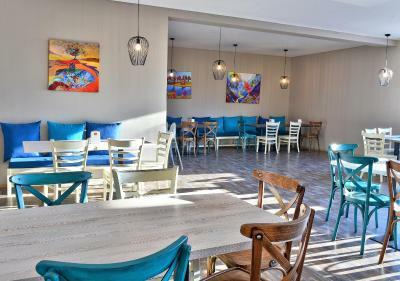 Cape Kaliakra, the ex-Romanian Queen Maria's Garden and Castle in Balchik and the Mussel Farm with small restaurants all can be reached within a 10-minute drive from Topola Skies Resort - Aquapark & All Inclusive. A 15-minute hiking on an eco-path will take you to the beach. 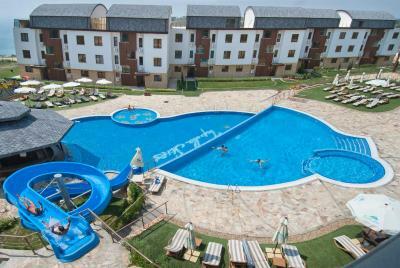 Varna Airport and Golden Sands Sea Resort can be reached within a 30 to 40-minute drive. 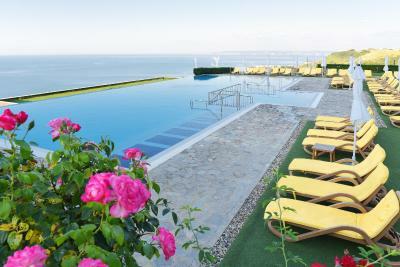 Albena Sea Resort can be found within a 15-minute drive. 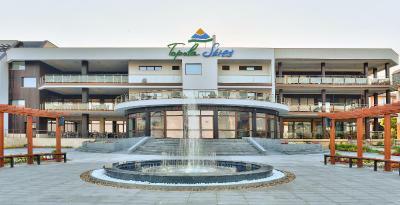 Topola Skies Resort - Aquapark & All Inclusive offers superb opportunities for entertainment and relaxation such as yacht trips, fishing, diving, jeep-safari, paintball and much more. 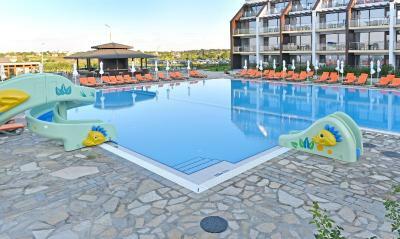 When would you like to stay at Topola Skies Resort - Aquapark & All Inclusive? 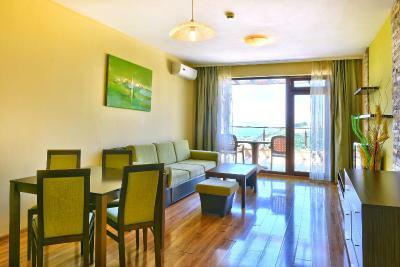 Comfortably furnished, the apartment features upholstered furniture, as well as a terrace with table and chairs. Air conditioning, a TV with cable channels and a seating area are available as well. 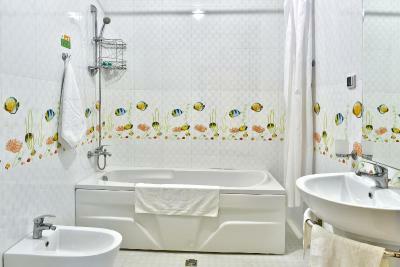 The bathroom comes with free toiletries, a shower and a bathtub. 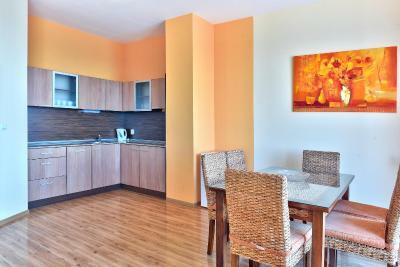 Comfortably furnished, the apartment features upholstered furniture, as well as a terrace with table and chairs. Air conditioning, a TV with cable channels and a seating area are available as well. 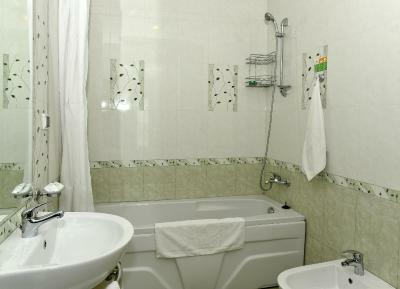 The bathroom comes with free toiletries, a shower and a bathtub. The balcony reveals sea views. 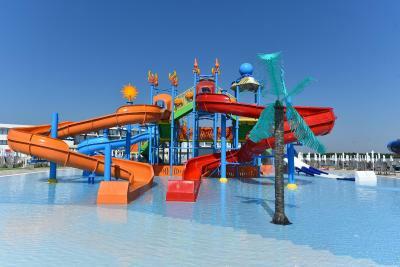 House Rules Topola Skies Resort - Aquapark & All Inclusive takes special requests – add in the next step! Topola Skies Resort - Aquapark &amp; All Inclusive accepts these cards and reserves the right to temporarily hold an amount prior to arrival. Topola Skies Resort - Aquapark & All Inclusive accepts these cards and reserves the right to temporarily hold an amount prior to arrival. 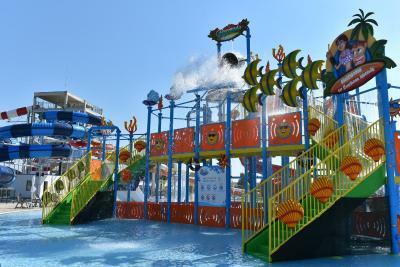 The aqua-park will operate from 15 June to 10 September 2018. There is no doctor/nurse on site, closest needs to be called out of Balcik, in case of emergency. I did not liked the attitude of the receptionist. We arrived at 13:30 to check in and he refused to give us the bracelets without any explanation. Even we paid more for 3 adults and we were 2 adults and 2 kids under 14 (which are welcomed for free as they said) we still have to pay 40 leva more to get the bracelets. Teach the receptionists to smile and be more kind and helpful, his attitude is like a guardian, quite aggressive. The drinks are miserable, the cheapest and poorest quality. Beer has no taste and I guess no alcohol. There are huge cues to take the food. The food is acceptable, medium to low quality but finally you can get something to eat. Even it is claiming to be a 4 star hotel all inclusive, there is no free coffee offered (please do not tell me that water with powder can be called a coffee). If you want quality drinks and coffee you have to pay. The water in the bathroom is smelling. There are no towels at the pool. SPA does not work, perhaps it is working based on money (all inclusive right?). It is located on top of the hill, however there are minivans each hour to the beach and return. Again, for a pretended all inclusive, sun-beds and umbrella are not free. Ah, and the last thing, they are organising weddings at the infinity pool, exactly where we were staying, all night music. Nice, isn't it? The coffe was horrible! The "a la carte" restaurant is close! 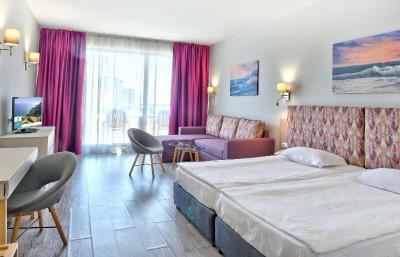 When we arrived we had to ask for another cleaning...but after this episode the cleaning ladies were very profesional! They do not have a vacuum for cleaning...i really think that the owner could invest in one vacuum! 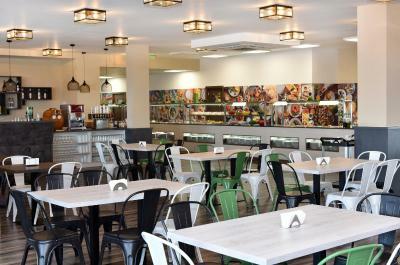 The quality of the food is not excellent, but you can find a big variety to choose from. Quality of the room equipment is rather poor one. No cutlery, no plates ect. Cleanness could be better. Variety of choices for food on the breakfast is limited. This is all inclusive hotel so you have access to the drinks but here also quality could be better. Not a 4 star hotel wouöd day 2 or 3 stars...staff are somehpw helpful but at the same time they laugh behind you back..beds were awful not comfortable at all...bathroom smells.. Please cut on the plastic cups used everywhere. Staff at the front desk and in the bars already tired after the season, but understandable. Terrible coffee in the machines. 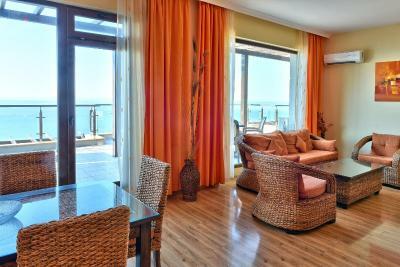 Very comfortable seaview apartments. 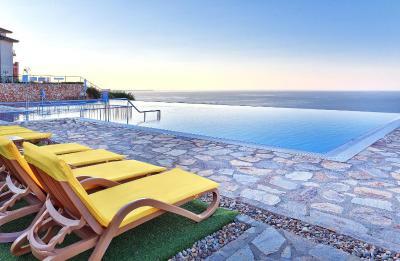 Wonderful infinity pool. it was forbidden to throw the toilet papers into the toilet, which is unacceptable in a 4 stars place. There was no drinking water in the apartment. We had to buy mineral water to be able to drink water in our room. Food and drinks didn't meet with our expectation at all. The coffee was Nescafe. You have to pay to drink an espresso. Wifi sign was poor, staff didn't speak English, receptionists were unfriendly and unhelpful. Extremely annoying that the vents of the AC were on our balcony, and blew the hot air, and were very loud. There weren't proper walls between balconies, no privacy. We caught some diarrhea at the end of the holiday. Unpleasant smell in the bathrooms. As a minus I say the distance to the beach. You need a car,or to use the minibus provide (for free) by the resort to the beach. The distance is about 1.2km away. The schedulle of the minibus it is about every 30 min. If the weather is bad, you're stuck. There is not much to do in the hotel. 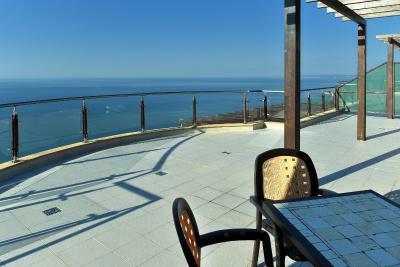 Balchik resort is about 10 km away, Varna is 60km away (no public transportation). Gym: they might as well close it down. Very disappointing, with dismembered machines and nearly rusting equipment. Food: Disappointing. There are 2 restaurants, above the Reception on 1st and 2nd floor. The restaurant is at the back of the hotel so no view of the sea. Food is ok at most, not varied and especially desserts are sweet rolls or cakes bought from the shop, not made in-house. If you're a vegetarian, you'll have to settle for a salad and fruits, as there is barely one vegetarian dish available at lunch / dinner. For the first time here, i was very impressed about this resort. 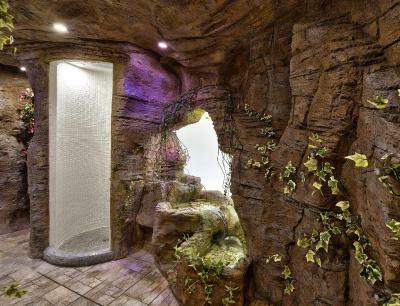 This "hotel" is actually an apartment complex, Designed to be sold as living apartments. The view is amazing... I recommend the sea view rooms. Hotel is very nice, immaculate clean and rooms well presented. 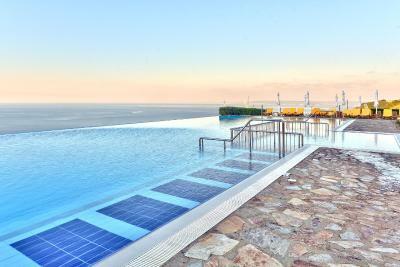 Swimming pools are very clean, large and the infinity pool is stunning. Parking: on-site, free. Parking space proved to be big enough for all guests. The Wifi is free and unlimited (when the signal is not lost). Entertainment: there is an amphitheatre with mini-disco for kids and some form of entertainment afterwards. There is unique animation programme for the children. During day time there are some music and activities around the swimming pool. Kids: I understood there are a lot of facilities for kids in terms of prices/accommodation, but if you don't want kids running around you all day, don't come here. I haven't seen any group/ couple/ family without kids. Check out Thracian Cliffs for golf and a nice beach. It's a five or ten minute drive down the hill and to the left.